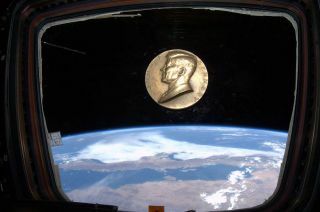 A bronze medallion emblazoned with the likeness of President John F. Kennedy floats on the International Space Station. An astronaut aboard the International Space Station has paid tribute to John F. Kennedy, flying a medallion to the orbiting outpost that bears the likeness of the 35th President of the United States. NASA astronaut Chris Cassidy, who is serving as a flight engineer on board the space station, sent down photos on Wednesday (Aug. 21) showing the medal floating in front of a windowwith a view of the Earth below. Sworn into office in January 1961, Kennedy was president when the United States sent its first astronaut into space, a month after the Soviet Union launched the world's first human into orbit. Just 20 days after Alan Shepard returned from his suborbital mission, JFK responded to the space race by challenging the country to make sending a man to the moon a national priority. "I believe that this nation should commit itself to achieving the goal, before this decade is out, of landing a man on the moon and returning him safely to Earth," Kennedy said in an address before Congress on May 25, 1961. Despite privately expressing concerns over the costs of a crewed lunar landing, Kennedy publicly celebrated NASA's progress, up until his assassination 50 years ago this fall. On Nov. 16, 1963, just six days before his ill-fated trip to Dallas, Kennedy made his third visit to Cape Canaveral, touring the launch facilities that less than two weeks later would bear his name in memory. The 3-inch (7.6 centimeters) bronze medallion that Cassidy flew to the space station was created as part of the U.S Mint's presidential medallion series. The commemorative's obverse (or front) features a high-relief bust of Kennedy. The medal's reverse in inscribed with a quote from JFK's 1961 inaugural address, "We shall pay any price, bear any burden, meet any hardship, support any friend, oppose any foe, in order to assure the survival and the success of liberty." Although limited by the size of their spacecraft, astronauts are permitted to carry a small number of mementos with them to the International Space Station (ISS). Dating back to Shepard's first flight, crew members have flown medals and other tokens to space on behalf of the organizations they support and which have supported them. "When he returns to earth this fall, Cassidy will bring the medal back to the JFK Library, where it will become a part of our permanent museum collection," the Library posted on Facebook. The John F. Kennedy Presidential Library and Museum, located in Boston, has a permanent exhibit devoted to the space race. In addition to displaying related artifacts from the Kennedy Administration and a moon rock on loan from NASA, the museum is currently exhibiting Alan Shepard's Mercury capsule, "Freedom 7," on loan from the National Air and Space Museum until December 2015.